Walking into a hair salon can sometimes be a daunting and intimidating task for a man. Confronted with a setting that is focused towards women is never an easy place for a man to feel comfortable. The music, the aesthetic and even the atmosphere does not cater to what a man enjoys. We caught up with Blokes creator Keri to discuss what Bloke is and why she started it. Having worked in the hairdressing industry for around 27 years, Keri had always wanted to create a barber shop. But, not your typical barber shop. More so, a place where men can come to relax away from women. To feel comfortable in their own surroundings and generally be the place for men to get away. Having also started and currently running Luna in Roslyn, it had been an idea of Keri's that had been brewing for around 15 years. The resurgence of the Vogel St precinct and that surrounding area of town was good motivation to find space amongst the beautiful old buildings. Having found the perfect spot and finally getting consent through a challenging and lengthy process, the complete fit out was completed in 12 days! Located in the basement space on the corner of Dowling and Burlington. The space has been converted into what one could describe as a 'man cave.' You walk in to be greeted by a clean, modern looking barber shop. Leather couches, men's magazines and a big screen TV playing old movies and sport. A place that would make any man feel welcome and comfortable. Not only will men be treated to a great atmosphere where they feel at home. But, they will also be groomed by talented and experienced hairdressers. Joining Keri and her 27 years hairdressing is one of her best friends Julie, who was the previous owner of 'Why Not Hair & Body.' Both shared the same vision and belief that there was a real need for a place like Bloke in Dunedin. Bloke offers some pretty unique services that Dunedin men have not had available to them. 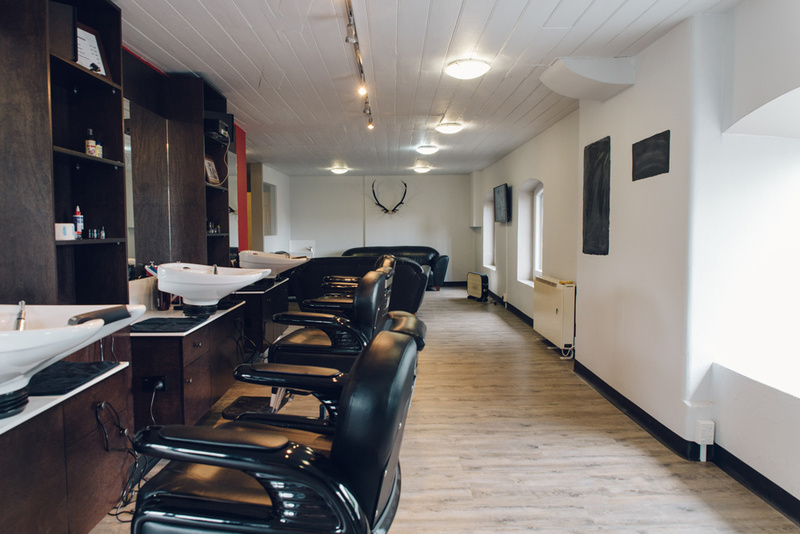 Services such as the reintroduction of the hot towel wet shave or the shoe shine. As well as, a beard trim, head shave, clipper or cut. Not only does Bloke have some great services on offer, they also stock some amazing mens haircare products. They are looking to expand their retail space in this area. Currently, they stock some pretty notable men's brands. Brands such as American Crew, Uppercut Delux and Alchemist. If you have not heard of them, they are definitely worth checking out especially if you have a beard. The Alchemist beard oil will transform the feel and look of your beard. Men being men don't need to worry about appointments. Bloke offers a walk in service (no appointments needed), but an appointment for a wet shave is recommended as it can take up to an hour to complete. Open for service Monday to Friday. Currently 8am to 3pm with late nights on Thursday and Friday. If your a guy out there wanting to enjoy, the experience of being groomed Bloke is definitely worth checking out. Take an hour out for yourself and unwind in their comfortable/modern man cave environment. Also note if you have wedding coming up Bloke is looking to cater for men. Why let all the women have fun getting pampered for the big day. Bloke will cater to the groom and his best men. Get ready for the big day with all your mates in a relaxed and enjoyable environment! Be sure to drop by - 2 Dowling Street, Basement.